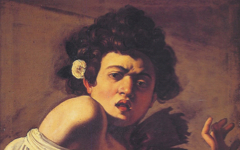 ......resembles Caravaggio's famous namesake, Michelangelo. 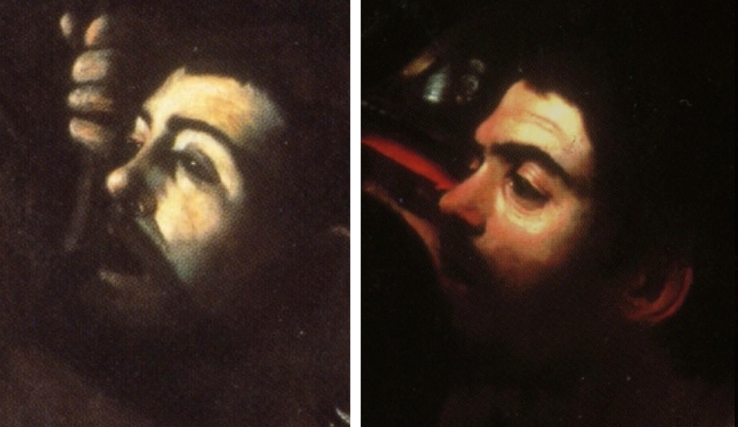 Caravaggio had used a similar lined and time-worn face to represent Michelangelo in The Entombment, as shown separately. In both cases "Michelangelo" is the key protagonist "handling" or "shooting" the "painting". Between "Michelangelo" and his "painting" of Ursula, a hand appears like God's, almost as if from nowhere, a foreshortened hand that like foreshortened hands in other paintings by Caravaggio represents the artist's craft. Appearing between the saint's potentially pregnant womb and the "archer", it indicates the need to combine conception with craft. 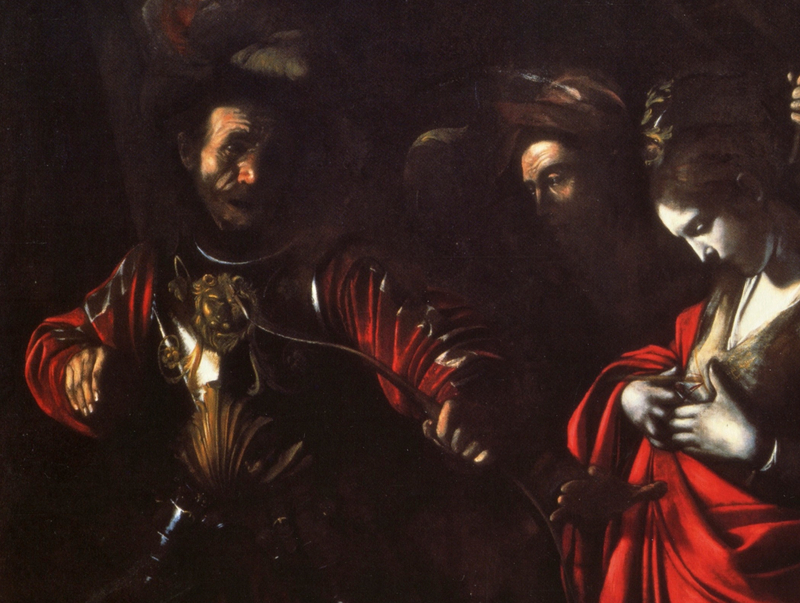 Here Caravaggio implies that his own hand has made this painting of "Michelangelo" painting "Ursula" even though the archer is already an alter ego of the painter. 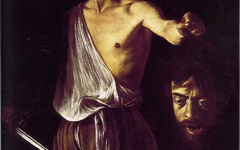 On the far right, scholars have long recognized the artist's actual self-portrait holding a spear (far left).4 The self-portrait appears in a similar role in the Taking of Christ, a painting which like this one is an allegory of painting (near left). The long, thin spear he holds is yet another symbol for a long, thin paintbrush. The artist thus appears three times: as Michelangelo in the archer, as the actual painter in the "disembodied" hand and as an onlooker in the youth, three different realities in one scene. 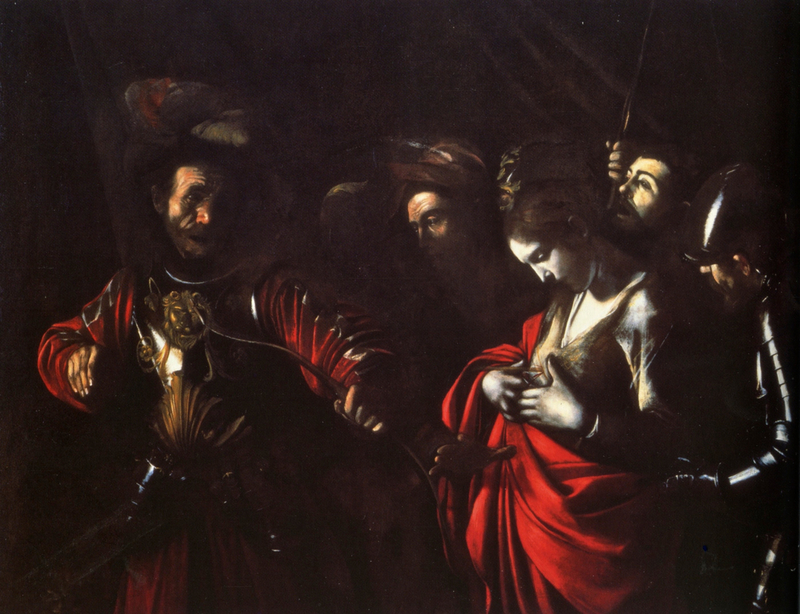 Don't let the belief that Caravaggio was a Realist lead you to think each of his faces has a different identity. Original Publication Date on EPPH: 04 Apr 2012. © Simon Abrahams. Articles on this site are the copyright of Simon Abrahams. To use copyrighted material in print or other media for purposes beyond 'fair use', you must obtain permission from the copyright owner. Websites may link to this page without permission (please do) but may not reproduce the material on their own site without crediting Simon Abrahams and EPPH.